Report by Major Tunbridge about Elands River, 15 September 1900, page 2. 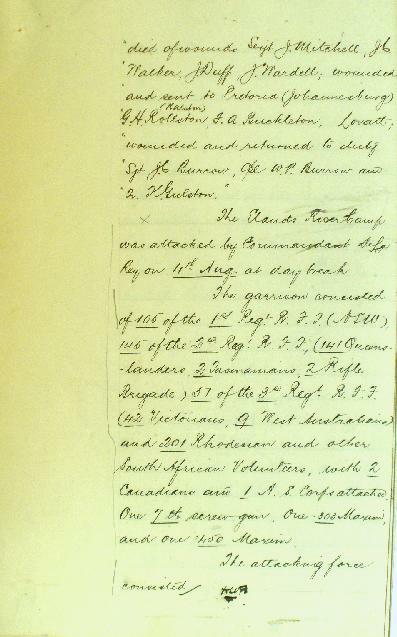 On 15 September 1900, Major Tunbridge wrote a report of the action at Elands River for the NSW General Staff of which page 2 is transcribed below. "… died of wounds Sergeant J Mitchell, JC Walker, J Duff, J Wardell; wounded and sent to Pretoria (Johannesburg) GH Rollston (Ralston), FA Buckleton, Lovatt; wounded and returned to duty Sergeant JC Burrow, Corporal WP Burrow and Trooper K Gulston." The Elands River Camp was attacked by Commandant De La Rey on 4th August at daybreak. The garrison consisted of 105 of the 1st Regiment R.F.F. (NSW), 145 of the 2nd Regiment R.F.F. (141 Queenslanders, 2 Tasmanians, 2 Rifle Brigade), 51 of 3rd Regiment R.F.F. (42 Victorian, 9 Wester Australians) and 201 Rhodesian and other South African Volunteers with 2 Canadians and 1 A.S. Corps attached. One 7 pound screw gun, one .303 Maxim and one .450 Maxim.